Once we have determined the WBS, Network Diagram, and Critical Path, we are in a position to further define our risk. Risk Management is one of the most critical success factor. If you actively manage your risk, you can save money for the company, and you have a greater chance of finishing your project on time, within budget and with satisfied customers and other stakeholders. Make sure you repeat the process every week, because changing the risk, and if you ignore them, they often change very quickly in trouble. • Create a 'What-If Analysis "
When you and your team have defined your risk, the next step is to analyze each one. 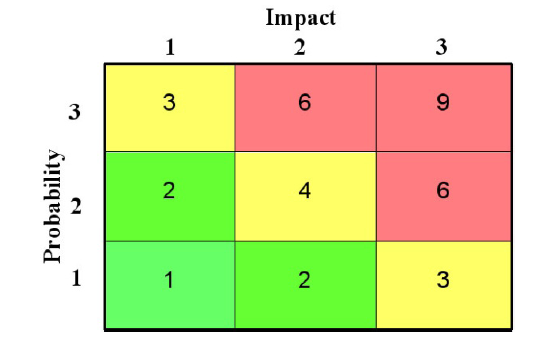 Then you can risk matrix below, to illustrate their relative positions. Just when you begin an assessment of the risks to decide what to do to avoid the truth (or problems). We recommend placing the risk in a Risk Register - an Excel sheet (with a description of their impact, their probability and impact number, and the multiplication of the two - the X-factor - allowing you risk by fixing their importance). You can then code the risk of color: red, yellow and green. Your goal then take the necessary steps to carry out some yellow and green risk action. It may not be possible to do all actions for each risk. It is therefore important to analyze the risks and decide what to do. It is also important to add the action, the expiration date and the person responsible for your Risk Register.